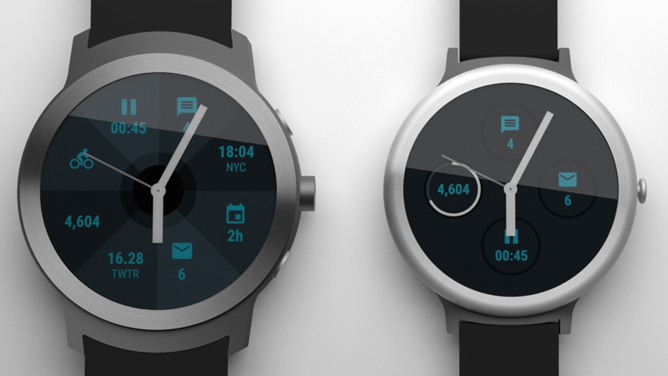 As we reported last week, Google is in the process of building two Android Wear smartwatches. At the time, we were unable to show you the watches themselves. Today, that changes - what you see in the image above could be codename and "Swordfish" and "Angelfish," Google's two Assistant-enabled wearables that we believe will be released after the new Nexus phones. With that considered, let's dive in. We are unable to share our primary source evidence for the renders we have created. Suffice it to say, we have seen enough to create these images, and believe confidently that they accurately depict the source material we were working with. These are not "interpretations," but recreations of primary source material for the sake of anonymity of our source. So, let's take a closer look. The watch on the left is the larger Swordfish device. As you can see, its large crown button is quite prominent, with the smaller "shoulder" buttons above and below it being much shorter. The watch face appears to be a new iteration of Google's new customizable faces in Android Wear 2.0, with an impressive if possibly overwhelming level of information density. As we stated in our original post, we believe Swordfish's strap and lug design will not allow for use of the Google MODE Android Wear watch bands, as the straps on this watch curve where they meet the bottom of the watch body. Swordfish has a chunkier, sportier design, and while not visible in this image, it is very substantially thicker than the smaller Angelfish on the right. Angelfish has a clean, smooth look to it - with only that slightly odd crown button breaking up its extremely symmetrical and minimalist look. 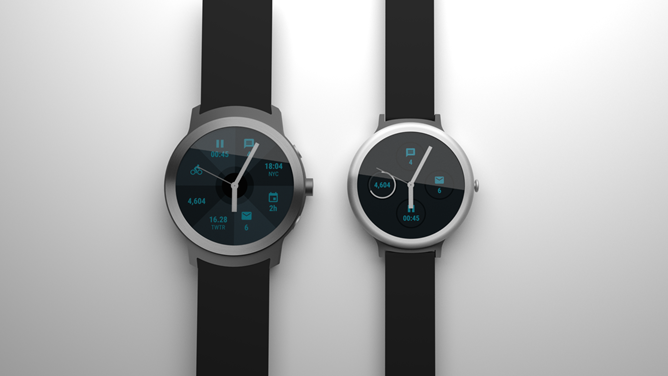 It's thinner, smaller, and lighter than Swordfish, and it will support use of MODE watch bands. Unlike Swordfish, the bezel on Angelfish has a gentle curve to it. Not pictured here is the fact that Angelfish's display glass also contains a small amount of circular display bezel, so there will be a black "gap" between where the watch body ends and the visible display area begins. My speculation is that this is how Google is avoiding the flat tire on Angelfish - instead of having a single spot "cut" out of the circle, Google just made a smaller circle. This has an obvious downside (smaller display area overall), but it would be a clever solution to the aesthetic issue of the flat tire. We wouldn't really know, probably, until the watch is seen in a live sort of context. We have no information regarding how the watches will be branded (Nexus, Pixel, Google? ), what they will cost, or precisely when they will launch. As a refresher: Swordfish will be the "full-on" standalone smartwatch, owing to its LTE connectivity, GPS, and heart rate sensor. It will be the do-all device that will allow Google to demonstrate Wear's most robust capabilities, including the announcement at Google I/O that Android Wear 2.0 will support standalone apps. Angelfish won't have LTE or GPS (and quite possibly not even a heart rate sensor), and will have a smaller display and overall size. It is clearly meant to target a lower price point, though how low, as I said, we really don't know. What do you think of the design of these smartwatches? Love them? Hate them? Can't really tell? I admit, having a single angle to work with when evaluating a watch is difficult, and we agonized over the best way to show you these devices in a way we felt would be faithful to the primary source evidence we worked with. As such, a straight-on shot seemed the least likely to engender confusion or create issues with proportions (thickness, curvature). It's not perfect, but it's what we can give you for now. The watches do, to my eye, bear Google's hard-to-pin-down but still recognizable aesthetic signature. The smooth, simple design of the single-piece watch bodies and the rather subdued faces would pair perfectly with a Nexus phone, wouldn't you say? Of course, as I've said, Google may have substantially updated or even completely nixed these designs in favor of news ones at some point during the development of these devices. That's why we're being a lot more conditional in our language as compared to the Nexus phone design we posted (which we remain confident is very, very close to the devices that will be released). This is more of a glimpse into one point in history - the big question is whether that history will be representative of a future reality. When we wrote this post way back in July 2016, we actually had the codenames of the watches mixed up - Angelfish is the LG Watch Style. Swordfish is the LG Watch Sport. (We'd had it backwards.) We've corrected this in the post, with this note serving as record of that correction.